LOVE. How great is this necklace?! Couldn’t believe my eyes when I found this little gem over at H&M of all places, definitely one of my new favorite pieces! And speaking of favorites, love, love, love the latest issue of RUSSH! How stunning is Marique Schimmel on the cover? The whole editorial makes me long for summer soo much..
H&M necklace. COS top. RUSSH magazine. 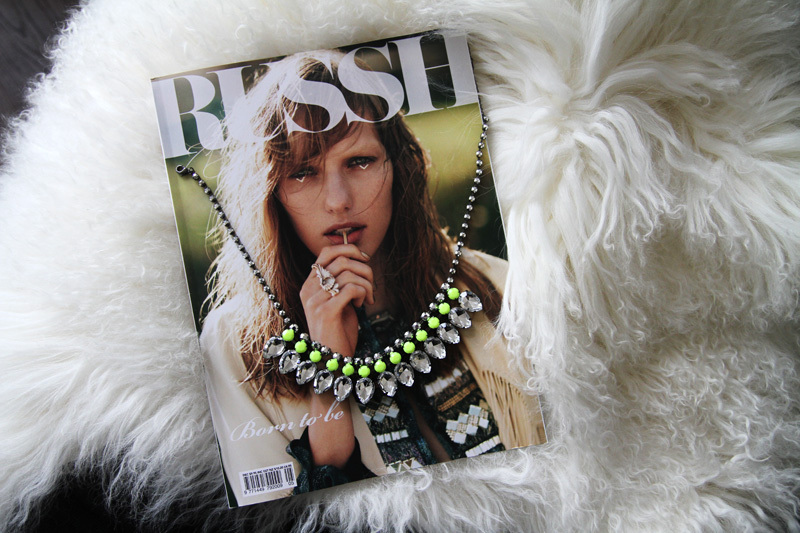 This entry was posted in Details and tagged H&M necklace, H&M rhinestone necklace, neon, russh magazine by Carolina Engman. Bookmark the permalink. that necklace is just só beautiful! these are so pretty! really wish to find them in my local H&M! WOW!! Awesome necklace!! So stylish!! It’s so great, what a good find! Oh wow, this is just a stunning necklace! i love love love the necklace! stunning! We love the combination of the bright colors and the sparkles! ahhh I want this necklace so badly. I am looking for it everywhere and can’t find it!! Great find! Love the necklace! wwooow!! i went to h&m today and i didn’t see it..i wish i will find it the next time..it’s gorgeous..and it looks expensive! LOVE that necklace!! What a good find!!! I hope they sell it in the US! This necklace is so popular, but I can understand why ! Really great necklace, also just from the look of the cover I might have to invest in a copy of Russh! Such a beautiful necklace! It really suprised me that it’s from H&M. I love the shape, very elegant! Wow – that is really amazing… looks beautiful! Riktigt snyggt! Hottar verkligen upp vilken outfit som helst. Yeah..this necklace has been all over the blogosphere for a few weeks. I can’t find it even if my life depends on it, I think they don’t have it over here (Portugal). You lucky girl! Love this necklace! I keep trying to find it in-store but it’s never there. Lucky girl! Very fun necklace –good find! 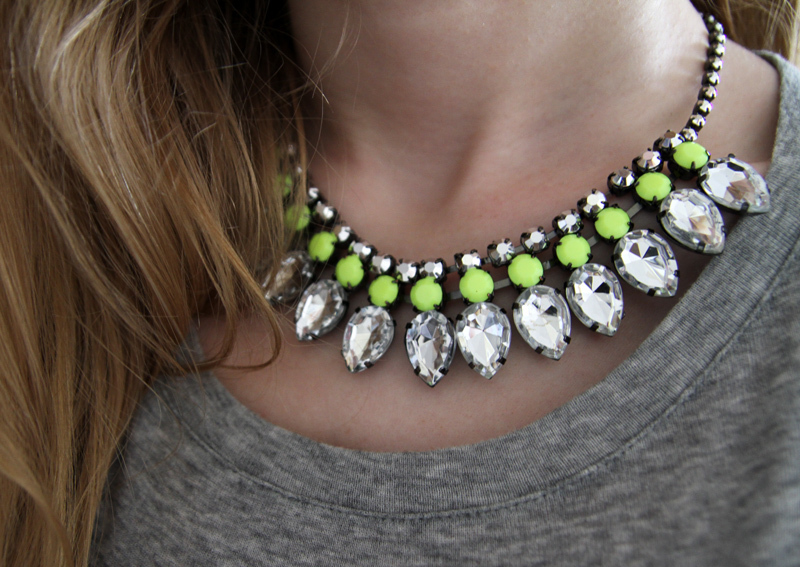 love that neon touch on the necklace! Ahhh that necklace is perfect and so is that mag. I love it. Wow! I didn’t think that was a H&M necklace! omggg so in love with this!! totally going to scour H&M! i’ve been on the lookout for this necklace after seeing it on This Chick’s Got Style! love it! 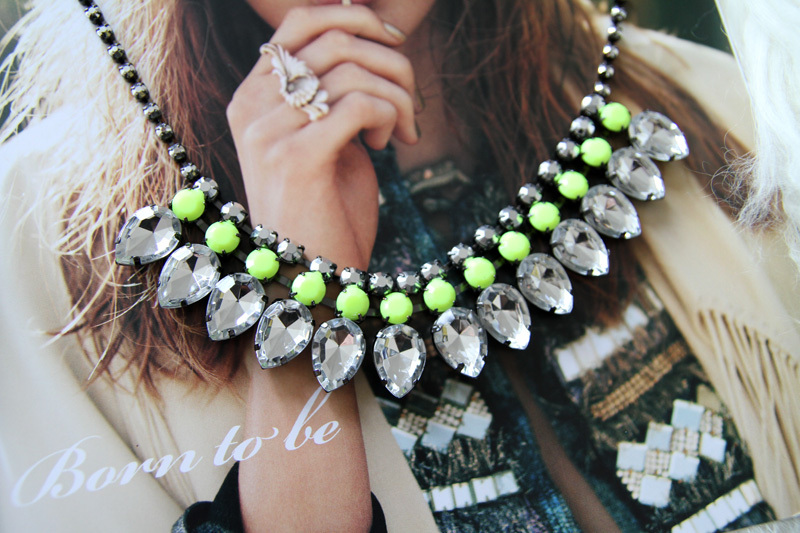 amazing necklace, remind me of Tom Binns designs with the neon touch! Adore this necklace but still can’t find it anywhere…bizarre! Yeah, it looks great but a little bit heavy. Am I wrong or is it as light as the price? Lovely necklace! I also checked out necklaces at H&M but I couldn’t find anything nice:( But this one is really stunning! This necklace looks absolutely great! Thank you for sharing this great find with us! It had exactly the same effect to me. And its right on trend! wauw it’s beautiful! i’m still looking for such a necklace! I just found this yesterday! I had been looking in every H&M in New York and finally found one left … I was so excited; the cashier asked if I needed medical assistance. Amazing! H&M! I totally need it! I’m still looking for it myself, hope I can still find it! Love the necklace. Perfect to make a simple outfit special. Amazing necklace, even more amazing that it’s H&M! they have such good value jewellery and accessories!! I love that that necklace! A fab way to add some sparkle! Great necklace! I was just in H&M sad I missed it. Love this necklace. I really need to go to H&M store in my city!!! Nice ! i want the necklace too! Fabulous necklace, have to get it… now! amazing things! !i like collars colors and the mag has such an interesting cover!!! lovely necklace, it’s so you! i love me too this necklace! i bought another necklace at HM in pink, ???????????? woah ok can’t believe that this is from H&M, super chic!! Such a lovely piece! Reminds me a bit of a vintage necklace I have that’s been in my family for generations. It’s good to see that beautiful things like this are still being made, and at places like H&M, too! You can’t stop loving metalics it’s too great!!! Love the neon jewelry trend. This necklace is beautiful. I have been searching for this necklace all over NYC and I can’t find it anywhere. So jealous! I looove your necklace ! I’ve beeen looking for it here in Paris but i can’t seem to find it ! this necklacke is absolutely amazing! After spotting it in your blog I had to go to H&M immediately. But unfortunately I couldn’t find it anywhere in whole London…. :/ Which store did you get yours from? It’s like the perfect necklace isn’t it? the color of the necklace is stunning! So funny! I found the same one saturday during my shopping spree. been looking for this for a while! So jealous. This is an amazing necklace!!!! I hope this necklace hits our H&M too, it looks like it’s having a private party :D.